Warning: I'll caution right now. Don't read this post about the new film Inception if you want to avoid any spoilers. I am going to do my damnedest to avoid overt information spillage, but to touch on some of the nuances of the film, and its themes, I will have to give away a bit here and there. That said, join me if you still want below. 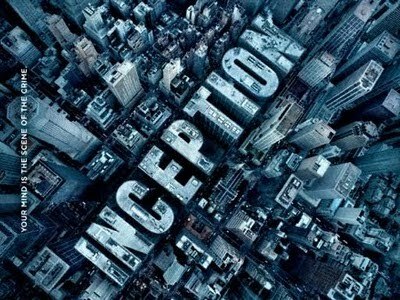 Inception stars Leonardo DiCaprio, Joseph Gordon-Levitt, Ellen Page and Ken Watanabe, among others (Ooh... Michael Caine). The film, directed by noted noir super-director Christopher Nolan, follows DiCaprio and his cohorts in their work as dream-jumping, sub-conscious exploring thieves. These people are like the upper-level secret agent/thieves from any traditional heist movie, but their setting is what sets them apart. The film opens with DiCaprio and Gordon-Levitt working a job in an ornate Japanese castle. But, we're not necessarily in that castle, or anywhere near it. In fact, we may be in a small, dilapidated apartment nearly under siege by protesting rioters. And then again, we may be just about anywhere at any time throughout Inception. And that's pretty much the big (BIG) question Nolan's film poses throughout. Where are we? What are we? And what is real? DiCaprio stars as a complex, dream-crawling prodigy who takes on an impossible sounding mission out of desperation named Dom Cobb. He is the best at what he does, but he's also deeply haunted by several issues from his past. Gordon-Levitt is his partner, a talented man in his own right, and also the all-business, straight man for any situation. Ellen Page is recruited to the team for the big job, as a talented designer of dreamscapes, building a world that is both fantastic and logical for the subconscious. The plot, more or less, follows any traditional heist noir, but the set pieces have the incredible opportunity to dazzle and show a world that seems conceivable in principle, but looks amazing in execution. Fans of Nolan's Dark Knight, among other films, will see the same visual aptitude and exemplary shot design. There are several moments that cannot be forgotten and drive pace of the film more than dialog ever could. Inception is a film-lover's movie. And Nolan excels at presenting something visually stunning. The only problems with Inception come in the writing, which occasionally features dialog driven to explain the scenario too obviously. An extended scene with DiCaprio and Page comes to mind. But, it's a tall order for any writer to present the litany of new (and some old) ideas about dreaming without providing some direct exposition. In the same way that Memento required some moments of "This is what's happening, just so you know, audience," Inception has its flat points. Still, the elaborate design and heady concepts of the film, including an ending that will have anyone thinking/talking for days to come make it a must see. Inception asks us repeated to question what is real. Is the world we live in daily real? Is the world dream actually the real one? Is there any difference? It brings to mind the Zhuangzi quote, "Now I do not know whether I was then a man dreaming I was a butterfly, or whether I am now a butterfly, dreaming I am a man." That's largely the crux of the film. There is action, sure, and excellent suspense, but Inception is about questioning reality, how far in or out of reality any one can go safely, and whether or not the real is as significant as we believe it is.